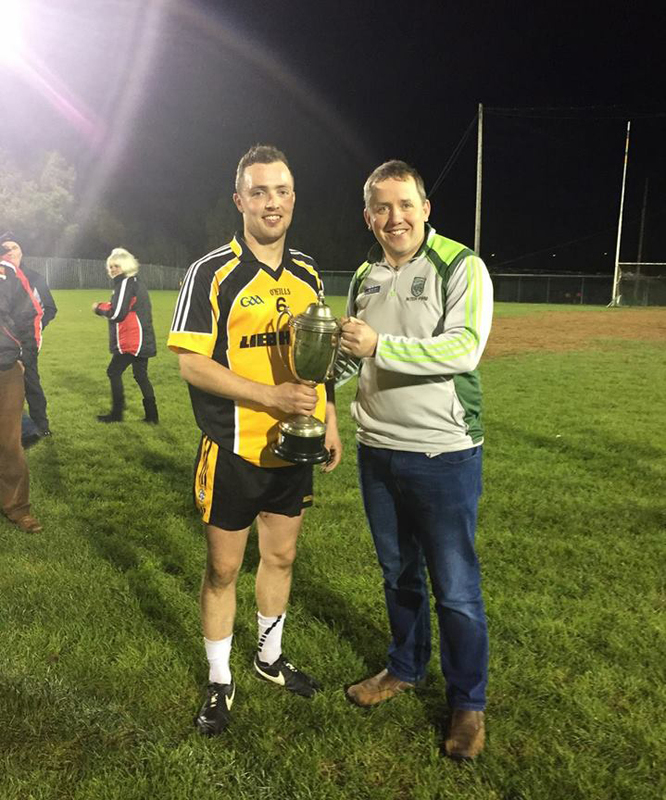 Liebherr retained their status as Kerry’s best Inter-Firm team on Saturday evening last as they edged a thriller of a County Senior Inter-Firm Final against Tricel in Lewis Road in Killarney. Liebherr had much the better of the first half, and took a 5 point lead into the break having taking a lead with the first play. Half Time Score:- Liebherr 0-11, Tricel 0-6. A thrilling second half saw play flow from end to end as Tricel put the defending All Ireland Senior Champions to the sword, scoring an unanswered 1-2 to tie the scores – corner forward Shane O’Sullivan finding the net for Tricel. Liebherr responded well and scored three unanswered points (2 frees). Points flowed back and forth to leave four points between the sides with five minutes to play, but Paudie Clifford finished off a fine team move to hit the net for Tricel’s second goal to leave the minimum between the sides heading for the latter stages. Tricel were unable to find the equalizer though, and Liebherr held on to take the County Senior Inter-Firm title back to Fossa. Full Time Score:- Liebherr 0-18, Tricel, 2-11. Liebherr Team:- Daniel Murphy (Knocknagree), Darragh Twomey (Cullen), Michael J Kelliher (Rathmore), Diarmuid Fitzgerald (Kiskeam), David O’Mahony (Muintir Bhaire), Padraig O’Connor (Gneeveguilla), Shane Prendeville (Keel), Kevin Gorman (Kilcummin), Daniel O’Sullivan (Rathmore), Ryan O’Carroll (Spa), Eoin Lawlor (Rathmore), Anthony Kennedy (Listry), Aaron O’Sullivan (Adrigole), Dan O’Shea (Currow), Morgan O’Donoghue (Sneem/Derrynane). Subs: Oisin Murphy (Millstreet), Robert Lucey (Killarney Legion). Tricel Team:- Andrew O Connor (Killarney Legion), Kieran Joy (unattached), Darragh Kelliher (Glenflesk), Ger O’Sullivan (Laune Rangers), Connie O’Connor (Gneeveguilla), TJ Friel (Rathmore), Sean O’Sullivan (unattached), Seamus O’Dowd (Milltown/Castlemaine), Chris O’Leary (Kicummin), Alan Looney (Milltown/Castlemaine) Paudie Clifford (Fossa), Aonghus O’Leary (Gneeveguilla), Shane O’Sullivan (unattached), Niall McClarnon (unattached), Richard O’ Donavan (unattached). Subs: Conor Stack (Spa Killarney), Stephen Roche (Milltown/Castlemaine).